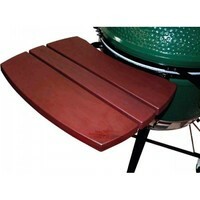 The new design big Green Egg Composite Mates - featuring a non-slip textured surface, a wider side profile, subtle wood-grain detailing and attractive BGE logo - provide an unmatched working and serving area for an EGG in a Nest, and are engineered to offer significant improvements over wood or plastic materials. And unlike wood that deteriorates over time, the Big Green Egg Composite Mates maintain a consistent appearance - with no need to refinish year after year! Big Green Egg Composite MAtes are custom molded in an oversized design to offer a larger working surface, and are constructed to the highest quality standard - choose from the standard two-slat design or the enhanced three-slat model for maximum working area. Mates fold down when not in use, and clean up is a breeze with mild household detergents... your Mates will look like new for years to come. Each set of Mates include L and R, with all mounting hardware!